This addon is no longer supported. You can take source code and modify the files for any purpose without any restrictions. Please don't forget to insert link in code to the original addon. В связи с некоторыми обстоятельствами (на самом деле, их предостаточно) русификатор Горыныч больше не поддерживается. Вы можете брать наш код и изменять файлы на свое усмотрение безо всяких ограничений. Однако не забудьте вставить ссылку в коде на оригинальный аддон. Горыныч еще будет доступен для использования до следующего обновления игры (с новым обновлением все может придти в нерабочее состояние). 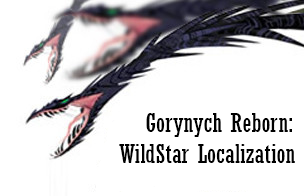 This is a beta version of localization addon for Wildstar. A default language is Russian. Translated text include interface, some lore and quests. Task for everyone who wants their language to be added - translate all tutorials or 1000 interface texts, or 100 entries of GA. Don't translate any Pregame and Options text. After that we can consider adding your language, and you'll have to copy your translation to our database. do you think it would be possible to post as additional download un-traslated version? We would like to make our own translation for the game and non of us speaks russian so we would not dare to start translating using google :-D .
Theoretically, we can make it possible BUT! it will take time and effort, and we have no resources for someone just to try his/her prentice hand. It's a very ambitious project, you know, and because of that you must prove you really can make it. If you (or your/other translation team) can handle with Galactic Archive (that means you can cope with the whole project) we'll start supporting your language, too. If you are agree with that, I'll send you GA in excel doc. You think it's possible to make the extension open to any language? so we can make teams to translate the game to other languages too!